Announcement Annual Aunt Mayme's Attic May Sale starting May 1. Discounts of 20% on the whole shop. Special customers receive a sneak peek code by signing up for email. And as always, FREE domestic shipping when you spend $25 or more in purchases. Annual Aunt Mayme's Attic May Sale starting May 1. Discounts of 20% on the whole shop. Special customers receive a sneak peek code by signing up for email. And as always, FREE domestic shipping when you spend $25 or more in purchases. 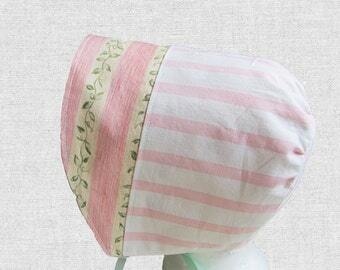 I bought this bonnet for my #4 granddaughter and gave it to her for Easter. She looks so cute! Thank you. ❤️❤️❤️❤️ love it! This thing is amazing. I should have purchased one a long time ago. A customer asked if I would make some vintage looking Christmas cards. It's fun to pull out lace, and fabrics to see how they work together. Now what am I going to do with this mess? Part of the work being done. My outside studio. Where I get some of my inspiration, while hanging embroidered items on the clothesline. Some lovely vintage linens ready to go from the flat stage to something special. Keeping History out of the Landfills and My Desire to Make Vintage "Portable"
Aunt Mayme's Attic developed from my desire to keep vintage embroidered linens out of the landfills and the few summers I spent as a child visiting maternal relatives, so many years ago. Aunt Mayme, ("May-me") my oldest aunt, lived in an old farmhouse with a walk in attic, which contained several assorted pieces of furniture, glassware, and most especially trunks that held clothing and other personal items. One trunk in particular (my favorite) contained pillow cases, tea towels, table cloths, dresser scarves, doilies; even a lingerie bag. Many hand embroidered linens Aunt Mayme, and possibly my long deceased maternal grandmother made. I would look at each one and realize the time spent working on them; such exquisite stitches! Sadly, I came to realize these items would never be used, nor would they be out on display, but forever stashed away in a trunk. Then they were tossed out; the piece of history they shared to be forgotten. Realizing we never can go back to that simpler time in our techno gadget world, I try to articulate the vintage feel in my creations by starting off with a vintage piece, and at the same time, make it useful for today's world. 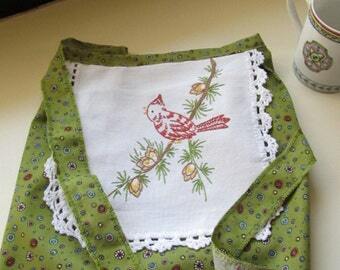 A vintage tea towel becomes an e-reader case; a piece of vintage lace adorns whimsical pillowcases, a vintage dresser scarf becomes a tote bag or pillow. I can't bear the thought of these lovely pieces of history being tossed in a landfill, forever forgotten. And all of my scraps and unused pieces are saved for dog and cat beds that I make and donate to a local animal shelter. It's about community, supporting the environment, and coming full circle! I'm sure you feel the same way; otherwise you wouldn't have read this far. So take a look; see if something inspires you. Let my modern aspirations of vintage linens make a special place in your heart. A repurposed vintage person, maintaining a love of vintage linens by keeping them out of the landfills and making them portable. Rockell is a vintage Singer 503A Rocketeer. She came to me in need of a job as she was stashed away in a cabinet for a very long time and needed a makeover. If I ever need a workhorse, I can call on her. Bertha is my youngest employee. A Janome 6500, full of muscle and brawn. She does just about anything I ask her to, but sometimes she can get a little snippy. Minnie (Singer Featherweight) goes with me everywhere. Her light green paint is pleasing to everyone's eye, and her small size is deceiving. She can go through many layers of fabric, and for long periods of time without giving up. Agatha's main role is when the lights go out, she comes out. All mechanical parts on her; no wires, no lights, no techno gadgets---just pure pedal pushing. An asset to any growing company. I'm happy to take your custom or personalized order as a lot of my business is that feature. I don't accept returns on custom or personalized items unless the item is flawed or damaged upon arrival. Many of my custom orders are completed within a week of the request, and sometimes within the processing time allowed. How are your linens handled? All of my linens and fabrics are washed in natural well water, with organic laundry detergent, fabric softener and/or laundry starch. They are line dried in the sun, weather permitting, or line dried indoors, or on gentle cycle in the dryer. Pressed with steam from natural well water, or organic laundry sizing, when needed. Then they are designed and created into the product you see in a one person, smoke free and pet free studio. With any return or exchange, you’ll be responsible for covering shipping expenses unless the product has a defect or flaw at which point I will pay return shipping, at same cost that it was sent. Please see my return policies for more information. Do you use recycled packaging materials? I'm an eco-friendly shop and take great care in the packaging of your items to ensure a safe delivery for you. I often use a recycled box or mailing envelope to cut down on waste and to pass the savings on to you. All purchases are placed in clean protective plastic bags. I won't send you something that I wouldn't want to receive. I'm new to Etsy. How do I pay for my purchase? Here is a helpful link, and if you have problems, feel free to contact me. Can I contact you about a problem? Yes! By all means! I encourage customer feedback as I don't have a variety of "testers" and won't know how something works for you. Any input you can provide me with will be received in a positive way. My job is to make you, the customer, happy with your purchase.